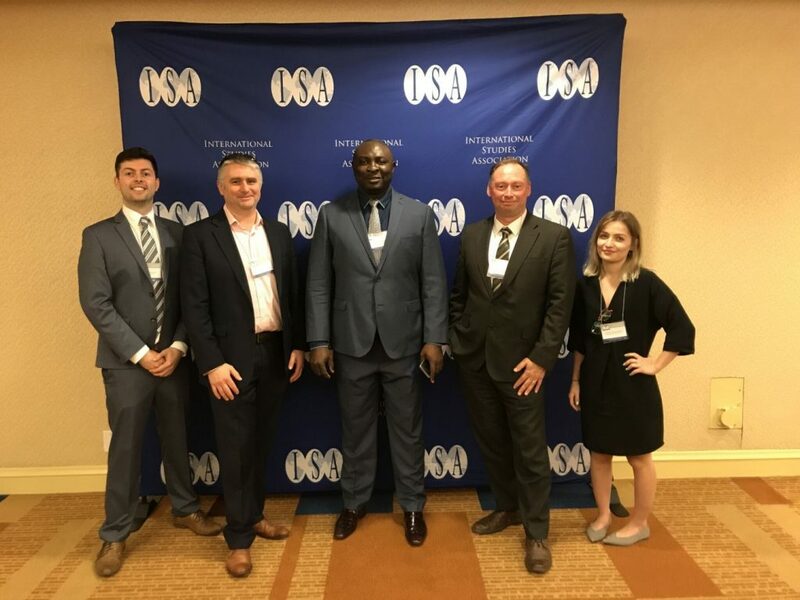 Cutting-edge research and agenda setting ideas of Bournemouth University Disaster Management Centre (BUDMC) were presented at a dedicated BUDMC panel delivered at the 59th Convention of the International Studies Association (ISA – widely regarded as the leading global academic association dedicated to international studies) in San Francisco, California, USA on 7 April 2018. The panel, chaired by Professor Lee Miles (Professor of Crisis and Disaster Management) was awarded after a highly competitive submission process. The panel together combined a Professor, a Senior Research Fellow (Dr Henry Bang) and three BUDMC PhD candidates (Michael Clark, Grace Kingsbury and James Stride) to deliver papers on their respective research in disaster management. The panel was distinctive in that the panellists also had significant experience, not just in the academic study of disaster management, but also in working in the field and in the crisis management industry – thereby representing practical examples of co-creation and the thriving research environment at the Disaster Management Centre here in Bournemouth. The panel called ‘Ruling in Unruly Times? Foreign Policy Dynamics of Disaster Management’ opened with a jointly co-authored paper by Professor Lee Miles, Dr Henry Bang and Michael Clark on understanding resistance factors and enhancing entrepreneurial resilience in disaster management in Ghana that represented unique research findings from the BUDMC’s acclaimed AFRIGATE project. This was followed by research papers delivered by BUDMC PhD candidates on ‘Synthesizing Foreign Policy Considerations and Health Systems Resilience’ in Africa’ (Michael Clark), ‘The International Dimensions of Maritime Disasters’ (James Stride) and a co-authored paper by PhD candidate, Grace Kingsbury and Professor Lee Miles, on ‘The Scandinavian Foreign Policy Collective: Managing Greater Imperatives of Resilience and Safety’ – that each demonstrated the depth of international-focused work undertaken by BUDMC researchers. The panel were subject to notable scrutiny by a discussant, and a vibrant debate; and the papers were warmly welcomed by an international audience of prominent academics from the field of international studies. The papers will form the basis of manuscripts to be submitted to key journals by summer 2018. For more information, contact Professor Lee Miles (lmiles@bournemouth.ac.uk) or Dr Henry Bang (hbang@bournemouth.ac.uk).